1 What Is Camtasia and How Do I Get It? 1.1 How do I get access to the software? 1.2 Where can I learn how to use it? 4.3 3. Recording "manageable chunks"
What Is Camtasia and How Do I Get It? Camtasia is a powerful screencasting tool that also supports video editing. It is available in Windows and Mac versions. There are differences between Camtasia for Mac and for Windows, depending on your purpose and what you are using it for note this breakdown chart between the two. Techsmith also offers Snagit, a powerful screen capture and editing tool. How do I get access to the software? UBC offers campus-wide free access to Camtasia for faculty, staff, and students. First, download the software to your computer, then install and open it to start making projects. Log in to Canvas with your CWL. Click the "Help" menu on the right side of the page. Click the "Software Distribution" option. Select "Camtasia" from the menu. Click the "Proceed with Download" button. Click the "Download" button and follow the instruction prompts to complete installation. Where can I learn how to use it? In addition to this introductory toolkit, Techsmith provides helpful video resources on all aspects of planning, production and post production. Before you do anything on your project in Camtasia, saving at the start allows you to be able to find it later. When you open Camtasia go to File > Save (for Mac) or File > Save Project (for Windows). Then select name and location. It is strongly recommended to name and save your project file in a folder. In this folder, also include any other media files you will use in your video so that everything is together in one place. Doing this first step allows you to keep organized with your project management and various files. 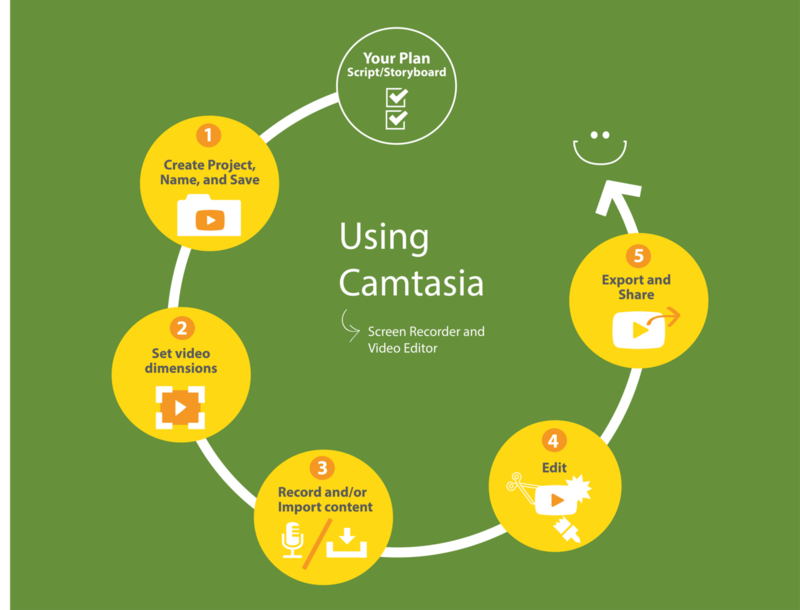 Before you begin in Camtasia make sure you have planned your project. Refer to the Plan It! section to complete your planning process. This will save you time and give you clarity as you go through screen recording and video editing. In Windows, .camrec are raw screen recording files and .camproj is your camtasia project with all your edits. 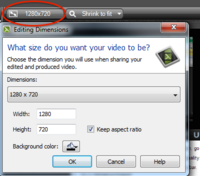 Setting your video dimensions before you begin editing ensures that the editing screen size is the same as the output. You want your editing size to equal your produced size.This allows you to avoid cases such as the black bar video syndrome. Here are some video tags strategies and other work-arounds to avoid black bar syndrome. To ensure HD quality in Mac set the dimensions to YouTube HD 720p beside Preset. To ensure HD quality in Windows remove the checkbox for Keep Aspect Ratio, and then set the width to 1280 and the height to 720. Utilize the preset options for both Mac and Windows especially if you already know what you need. Select the apporiate dimensions to the resolution (i.e. HD: 720) you desire for your finished product. Setting your video dimensions in HD is the work-around to ensure that your video keeps its resolution when uploading to Kaltura. Checkout Techsmith's Recording Tips as well as how to Record a Powerpoint or Keynote Presentation. With the import functions you can also important other media files such as audio (i.e. music), related images and/or other related footage that can add to your video project. Editing is the process of manipulating video footage files, media, audio files, and more. More specifically it typically can include adding special effects, pop-ups, splicing & moving around media files (video, audio, photos). Camtasia for Mac (Version 2) Tutorials which includes Explore the Editor, Preview, Trim, Cut, and more. Camtasia Studio for Windows (Version 8) Tutorials which includes Explore the Editor and more. Explore various features and techniques but make sure there is flow and that there is nothing distracting from the main focus of your video. Utilize various transition effects to help with flow between images and video files. YouTube: is an option if your project relies on open sharing and wide audience reach AND if you are not REQUIRING students to set up their own accounts. Setup your own youtube account or you can upload to the UBC youtube account with this documentation. Kaltura: a UBC hosted service and thus offers a layer of security and content moderation. Offers an option for learning activities that require students to record, upload and share video content through Canvas. These videos will be transcoded for easier viewing on multiple devices, stored in a central platform, and will be available for searching and viewing. Compared to Youtube Kaltura offers more granular control over content and contributors. Consider reach. If you want a wide reach for your audience, choose an open hosting environment (like YouTube). Consider privacy. If you need a certain amount of protection around your content, choose a locally hosted option (like Kaltura). Consider useability - if videos are long and you need to be able to search the content on key words consider a tool like Mediasite. All of the following examples are videos produced using Camtasia. There are 4 videos in this playlist. This playlist introduces viewers to the process of developing a video tutorial. It is intended for students in Dr. Eric Meyers' user instruction course in which he covers the principles of teaching and learning as applied to library-based information literacy. This series of videos supports the final video assignment for the course. It is based on a screencast/voice-over technique using TechSmith's Camtasia for Mac. The video series was designed and executed by MLIS student Nick Josten. These videos were created by Dr. Luis Linares, an electrical engineering professor at UBC. He describes the video as short videos that students can view "away from the classroom, empowering the student to tune in when he or she is ready for the next lecture, day or night, seven days a week. These videos are short with dense content, delivered at a fairly quick pace with the idea that students can pause rewind etc. More examples on Dr. Linares' YouTube Channel. This video was developed to introduce an online course "Getting Started in Connect." The purpose of the video was to include more instructor presence in the course and provide people with an overview of the online course. Record the screen in a larger size possible. By doing this, the quality of the your video will be retained when you upload to video server such as Kaltura, Cousera and YouTube. On tutorial on how to edit the video dimension of your recording, read or watch the tutorial by Techsmith for Mac and Windows. Talk slowly when you record the screencast. So that during the post-production, it will be easier for you to edit your voice. You do not have to re-take if you make a mistake during the recording. You can just pause for 10 seconds, correct your mistake and continue with the recordings. You will be able to edit out your mistakes in the post production process. Instead of trying to record your entire powerpoint presentation in one attempt using Camtasia (which is virtually impossible as we all know and will take many attempts! ), try recording one slide at a time. Each slide becomes an 'entity' all on its' own. You can then 'stitch' them together in Camtasia. Note: After you record your 'chunks' (i.e. slides), make sure you rename them accordingly (see image at right). This renaming will help you position the correct 'chunks' together on the timeline. Again, instead of trying to record your audio/video (i.e. tour of a webpage) together in one attempt using Camtasia, record your audio FIRST and save it. This way, the audio will have its' own timeline, separate from the video (and other media). Next, you can drag different media onto the timeline to align with your audio. Note: Remember to adjust the setting to 'screen off", then hit the red record button to record just the audio. Recording a PowerPoint in a widescreen: by default, your PowerPoint slides will have an aspect ratio of 4:3. When you record slides like that in Camtasia, and upload them to YouTube, you might see black bars on the sides of the video. To prevent this, you'll need to change your PowerPoint slides' aspect ratio to 16:9. Click on the Design tab, and select Slide Size. Watch this video by Techsmith: Record a PowerPoint or Keynote Presentation. The video has best practices and tips for recording PowerPoint presentations. In Microsoft PowerPoint, open the PowerPoint file that you want to change the aspect ratio of. Beside Slides sized for, select On-Screen Show (16:9) from the drop-down menu. Then press OK. Consider which video server you are going to upload to. Video server is a final location on where to upload your videos such as Kaltura, Coursera, YouTube and Vimeo. Each video server has different recommendation on the video dimensions. In Kaltura and Coursera, the video dimension that they recommend is 1280X720 (780p). After you record the video in a full screen, edit the canvas size to the size that you want to export the video to. For example, if you want to export the video size of 1280 X 720 (780p), adjust the canvas size to 1280 X 720.See the instructions on how to adjust the canvas size on Mac and Windows. Camtasia's interactive features can only be used with the TechSmith Smart Player. That is, the ability to create a table of contents, clickable URLs (aka, "hotspots"), and all the quizzing options are lost if you don't use TechSmith's Smart Player. As none of these features work in other media players, (e.g., YouTube, Kaltura, Windows Media Player etc.) you'll have to decide whether the interactivity or the video host is more important to you and plan accordingly. 1) Create an account at Screencast.com which entitles you to 2GB of free server space. Within Camtasia Studio, save your finished project to Screencast.com (it's on the "produce and share" menu). Once your video has rendered, click the orange "details" button to find your embed code and stable URL. This is a good option for folks who won't burn through a lot of server space, and you can choose to have a "private" or a "password protected" account if you don't want your files to be "public." Screencast.com's embed code works on the vast majority of websites and blogs, including WordPress and (for Librarians) LibGuides. **Note:** This embed code is not currently supported by UBC Wiki. 2) You can "Produce and Share" the file as an MP4 with a Smart Player Wrapper or choose the Custom Production Settings link and leave the default radio button for MP4-Flash/HTML 5 player checked. If you choose option 2 you'll need server space to host your MP4 video files. For Connect users, it's relatively simple to upload these files into your course shell. TechSmith does have some documentation explaining to users how to get these files embedded into a CMS, website, blog etc. If you've taken advantage of Camtasia's quizzing features and would like to integrate your quiz scores into your Connect grade book you'll have to choose the Custom Production Settings link, keep the MP4-Flash/HTML 5 player button checked and when you click through to the "Video Options" menu make sure to click the SCORM box under the Reporting section. Either of these 2 options will work for making the final videos fully functional in any browser and on most devices. Smartphone users will likely have to download T-Smith's free Smart Player app. In most cases, you will be uploading a video to a video server(s). Such as YouTube and Kaltura. In order to achieve the best quality, check the video specification(or recommendation) for the video server that you are going to upload the video to. Then, adjust the export setting so that it matches with the video specification. See the list below to check the video specification for major video servers at UBC . By default, Camtasia will export video with variable video bitrate(data size of the video) so that it will allow Camtasia to export videos in lower file size with a decent video quality. However Kaltura interpret the video as low quality if the video bitrate is not high enough. This is why your video will look blurry on Kaltura even though your original video file is in a decent quality. On Kaltura, there are only 3 transcoding options which are: HD720p(high quality), SD540p(medium quality) and SD 360p(low quality). This means, if you upload a video with a lower-medium quality (which can be around 480p), then once you upload the video to Kaltura, the video will be degraded to SD 360p (Low quality). Select Adjust Canvas. Beside the Preset, select YouTube HD 720p. Click on Share, which is located on the top menu bar. Click Ok, and press Export. The video above is a short sample video that is exported in HD quality using Camtasia Studio 8 (Windows). Click on the Canvas Size option above the preview. set the width to 1280 and the height to 720. Click on File, and press Produce and Share. Under File Format, Select MP4- Flash/HTML 5 player. Click Next, and then select Finish. Press Next, and then click Finish. This page was last edited on 21 December 2016, at 19:23.